The Laugh Factory requires a two-drink minimum per person, not included in this Groupon. Limit 8 per person. Valid only for option purchased. Reservation required, call 773-327-3175. Redeem day of show for a ticket at venue box office. 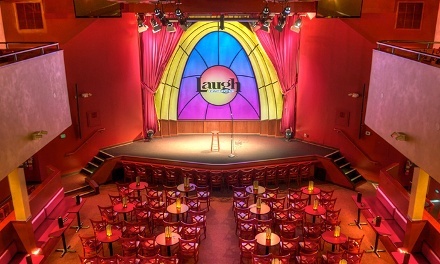 Must show valid ID matching name on Groupon at Laugh Factory. Refundable only on day of purchase. Must purchase together to sit together. Discount reflects Laugh Factory's current ticket prices-price may differ on day of the event. Door time varies. Not valid for special events or on Saturdays. 2-drink min. required per person. Must be 18 or older.